When I was still a teenager I asked my father what the definition of intelligence was. My father is an art historian and an intellectual, a man who has spent his life in the rarefied realm of ideas and history. But he is also a man very much concerned with living the good life, with enjoying the material. It seemed to me, even back then, that if anyone could explain how a smart mind worked, it would be my father. And so he did. "It's the ability to connect abstract ideas and make them concrete," was his answer. I've often thought that conceptual art was too concerned with abstract ideas. Concepts that take precedence, sometimes even replace, the aesthetic and material side of art. It's the rare artist whose work combines both the abstract and the concrete, the conceptual and the actual. Agnes Denes whose show, Sculptures of the Mind: 1968 to Now, is on view at Leslie Tonkonow Artworks & Projects until January 19, 2013, is the even more rare artist, one who maps the process from idea to concrete apparition and back again. Denes is an internationally recognized artist and the first environmental artist to synthesize land and performance art. At various times, she has incorporated mathematics, linguistics, philosophy, technology, theology and ecology into her work. The form her art takes is as varied as the sources she draws upon: drawings, sculptures, earth/land projects, performance, writings and photographs, to name only a few. On view at the Tonkonow show is a photographic and textual documentation of one of her best-known projects, Wheatfield -- A Confrontation from 1982. 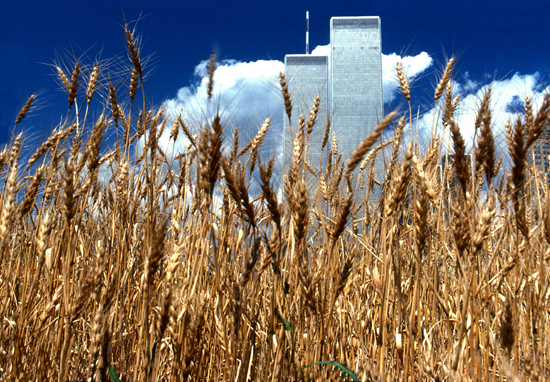 In Wheatfied, Denes planted two-acres of wheat in downtown New York, a comment on human values and misplaced priorities even then, of a real estate mad city. But, Wheatfield was also a stunning visual statement, a rich golden field smack in the middle of the stark cityscape of Manhattan. After the wheat was harvested, the hay was fed to horses and some of the grain traveled globally in the International Art Show for the End of World Hunger organized by the Minnesota Museum of Art, 1987-90. The piece had an actual, living cycle. Concept became art, art became food, food cycled through the ecosystem and we were left with the documentation -- with art. Much of Denes's work is concerned with cycles. Long ago she coined the term "eco-logic" to describe her art making process: thought and life, birth and death. An early example is Human Dust from 1969, a piece that documents a man's life through photographs, text, and actual cremated human bones. 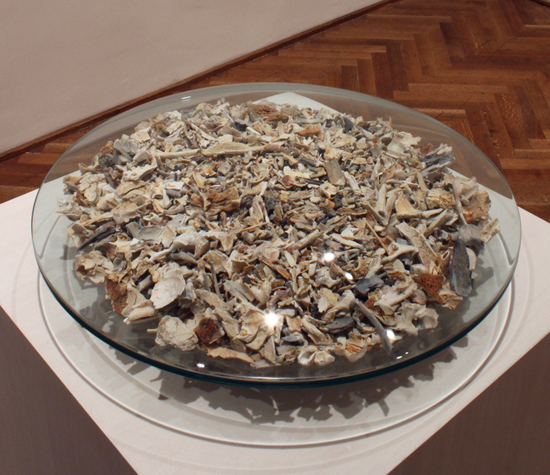 The bones are quite beautiful, calcified and organic shards displayed on a pedestal under a Plexiglas disc. The text is a poetic list of statistics. He was an artist. He died of a heart attack. He was born 50 years ago, which means he lived half a century or appr 2/3 of his expected lifespan. A demonstration of what we will all be reduced to, dust and facts, and yet the text all tells us that this everyman fathered 2 human beings, thus beginning a chain of 60 or more human beings added to the world population within 4 generations (counting up to 2000 A.D.). Like Wheatfield, the cycle of life and art continue. Systems. Denes is fascinated by systems and patterns. She maps out her projects in detailed and delicate drawings, a form of visual mathematics. 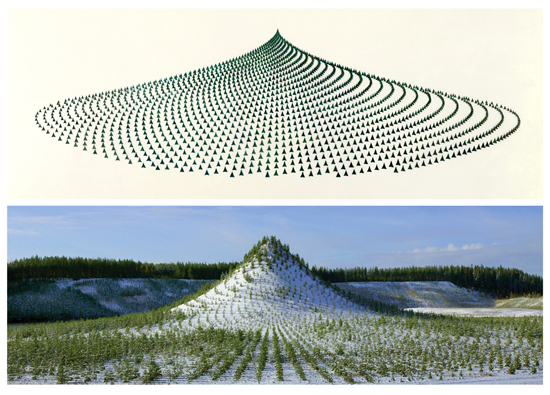 In Tree Mountain -- A Living Time Capsule, conceived in 1982 and planted in Finland in 1992-96, Denes created a manmade mountain and planted it with eleven thousand pine trees in an intricate mathematical pattern. It is eco-art in the truest sense of the word, a land reclamation project dedicated to humanity and to our natural environment. Tree Mountain has no lifespan; or rather its lifespan is unknown, projected into the future. Denes's art moves from one state to another, from the micro to the macro, from immediate to infinite, from part to whole, from the self to culture, from cold mathematics to gorgeous imagery. She doesn't allow boundaries to be finite, but is concerned with the process of change and the flow of information from one system to another. Her sculptures move beyond the concrete, to a place of open-ended, free reign, Her materials, whether wheat or trees or even a human life, stretch into the infinite. And so I come back, full circle, to my father. Who I should fully disclose is the art historian Peter Selz and who first introduced me to the work Agnes Denes, and who himself, wrote in an essay on Agnes Denes for her show at the Johnson Museum of Art at Cornell University in 1992, "Everything is connected in Dene's multifarious work. Her concepts deal with space, but ultimately her work is focused on the life of humankind and on the human predicament."